My name is Ajok. I come from South Sudan (in 2005). Before I came from South Sudan, it was all Sudan, not separate. But we are separate now, we are South Sudan now. And when I came to Australia, I go to Khartoum first then to Egypt. And we do the process with my husband and my kids. I born two kids in Egypt, and we came to Australia. How long did you have to spend in Egypt? Three years. We do process three years in Egypt. Was it dangerous leaving Sudan and can you describe the journey from Sudan to Egypt? When we come from Sudan to Egypt we have war in Sudan. That’s why we come to Egypt, with my husband. Egypt is very good. What was the hardest thing for you when you arrived ? When we arrived here ( in Australia), I don’t know the language very well. 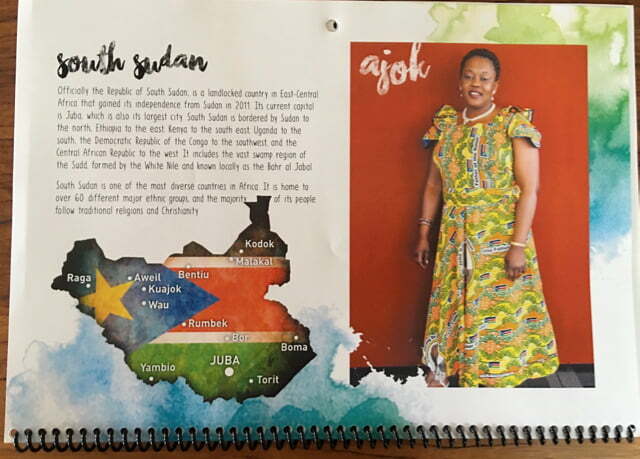 We have Dinka and we have Arabic in Sudan before. But when we come here, we don’t know English. I’m listening, but I didn’t talk. When I came here, I didn’t go to school. My husband went to school first and I stay with kids. It’s hard. When my husband go to school I will stay with my kids and when we don’t have something in my house, we wait until my husband coming back home. You couldn’t go out and do the shopping? Ah no. I have small kids, two or three, no-one with me. I’m waiting for my husband coming. My husband learn to drive and this is helping. We do everything together. And now we are happy. My husband finished school in 2010. When we coming from Sudan, he had three years in uni. And now he finished here – medical doctor. And now my children – the older one now is going to the uni, designer, and we are happy. And the second one now in year 11 and we are happy too. And the last one in year 1. I have six boys and one girl. And my husband and me we are happy in Australia. Not all kids, but some kids, they don’t listen to us. They say these rules in Australia is good. But when they go out, they don’t do good things. Your Mum not there, your Dad not there, no older ones to say to you “Don’t do this, Don’t do this. ” That’s why they do crime, crime in the streets, crime everywhere. And then every white people they see black people and think they don’t do good things. But not all. This is not our culture. This is the rule for Australia culture. We feel no good. For us, when you see on the TV they say black people do this, they do this, you not feeling good. You feeling like tell your kid and your family to go back in your country. But not safe in our country. That’s why we are here. We don’t do anything. When we come to Australia, the Australia rule say when your baby or child turning 18, they go out. But in our culture, no. You stay with your kid. Your boy – when they have married they stay in the house, not go outside. And girls too, when they are married they go with their husband (family). And here rule in Australia this is a bad rule in Australia, that when the kid is 18 and then they go out to take care of themselves. This broke our hearts. And we sad for this one. But now our kids not listen to us. We want to talk with the Australian people. We are good people. We are not bad people. This is kids who take the rule here. This rule is not our rule. This is my dream, I pray to God, all my kids to be good, not take the Australia rule and all this. They follow the school and they follow good things, not follow bad things. This is my dream. 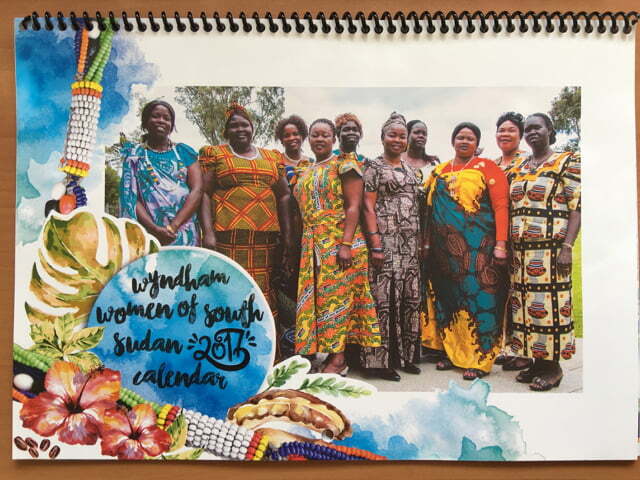 *The Wyndham Women of South Sudan group was set up to provide English literacy skills and to build a community. 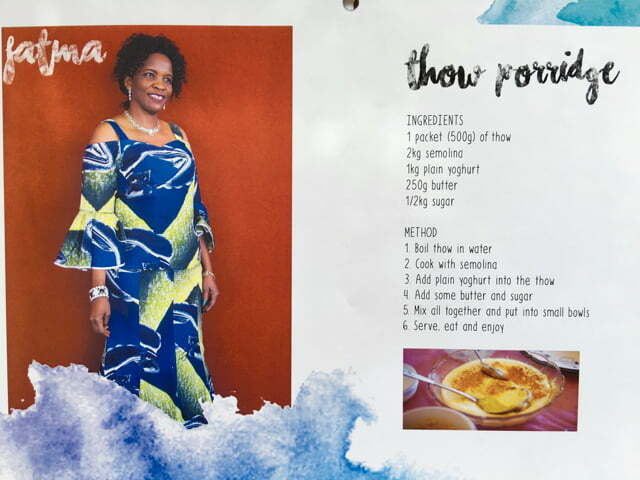 The English class produced a 2017 calendar which features some traditional Sudanese recipes. Anne Summers AO can be described as someone who is always in the vanguard as a feminist, journalist, author, editor and publisher. Anne has just published her new memoir Unfettered and Alive. Former Governor-General Quentin Bryce described the book as ‘Exhilarating and what storytelling!’ Anne tells her story of travelling around the world working in newspapers and magazines, advising prime ministers, leading feminist debates, writing memorable and influential books. It is the compelling story of Anne Summers’ extraordinary life. Forty one years ago, Anne Summers lead the charge into an abandoned building in Sydney and co-founded Elsie, the first women’s refuge in Australia. She again led the way in her revelatory and now classic book Damned Whores and God’s Police, which was published in 1975. It showed how the Madonna or Whore polarity in attitudes toward women, derived from Australia’s colonial past, had become entrenched and influenced Australia’s subsequent political and social culture. Anne was given an official leadership role when she ran the federal Office of the Status of Women (now Office for Women) from 1983 to 1986 when Bob Hawke was Prime Minister, and she was an advisor to Prime Minister Paul Keating. 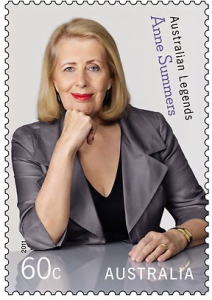 For her distinctive role in advancing women’s equality, she was presented with the Australian Legends Award for 2011 and joined the exclusive ranks of great Australians to appear on a special Post Office stamp. In 1989, Anne was made an Officer in the Order of Australia for her services to women and to journalism. 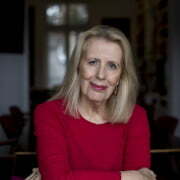 As a journalist and columnist, her work included being Canberra bureau chief for the Australian Financial Review and the paper’s North American editor. She was editor-in-chief of Ms. magazine in New York in 1987. She now writes a regular opinion column for the Sydney Morning Herald. Three years ago, Anne created Anne Summers Reports www.annesummers.com.au. 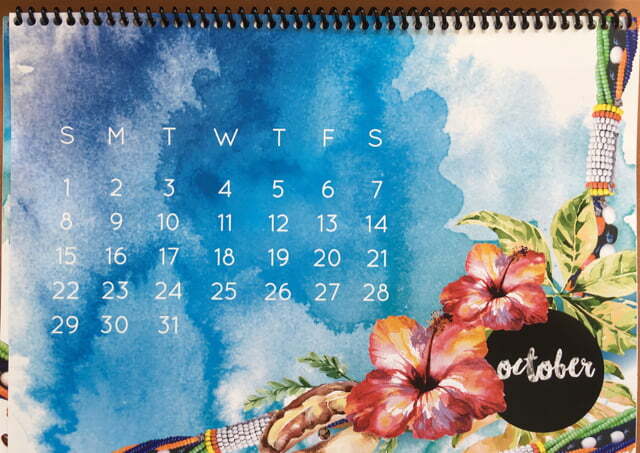 As its editor and publisher she is now part of a new trend of women publishing online magazines. ASR is a high quality digital magazine that covers a wide range of topics. The August issue highlighted the world-wide practice of female genital mutilation and Nimco Ali’s campaign against it. In September 2013 she began her series of very popular Anne Summers Conversations http://www.annesummers.com.au/conversations with former Prime Minister Julia Gillard at sell-out events in the Sydney Opera House and the Melbourne Town Hall. 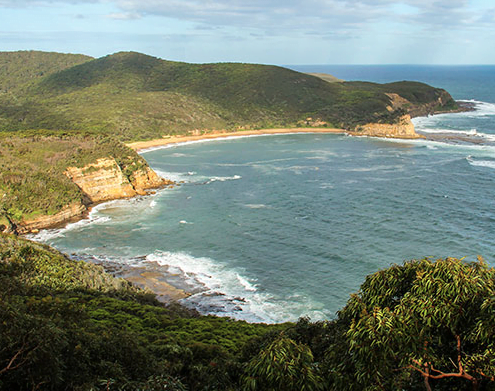 On the New South Wales Central Coast. A tiny laid back and undeveloped settlement with just a handful of houses looking out over the bay, with the Bouddi National Park for backdrop and birdlife like you’ve never seen. You want kookaburras to join you on the deck for cocktails? Just pop the cork. 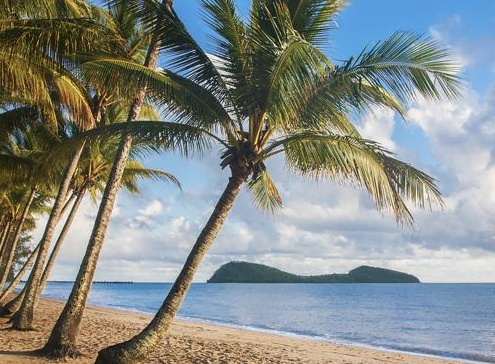 Situated about 30kms north of Cairns in Far North Queensland, Palm Cove is the kind of old-fashioned place that gives resorts a good name. A place where buildings are not allowed to be higher than the ancient Melaleucas which Captain Cook is supposed to have admired when he stopped their briefly to replenish his water supply. And it has city-quality restaurants (unfortunately with city level prices). You can’t swim most of the year because of the stingers but you can’t beat a walk on the beach at any time of the day or night. I first came to this dazzling city forty years ago and I kept coming back even after stints living in places like New York. Sydney is a vibrant and physically stunning place with a diverse and (mostly) tolerant population where anything is possible. Bad stuff happens here (as in any big city) but the good far outweighs it. And physically it is unbeatable, with a surprising, and usually stunning, piece of landscape seemingly around every corner and over every horizon. The dark heart of our history, the site of an unimaginably cruel penal colony during the convict era and of Australia’s worse modern day mass shooting in 1996. Much of the prison and its associated buildings, including the chilling prison chapel (designed so convicts could not look at each other during the service) are remarkably intact. 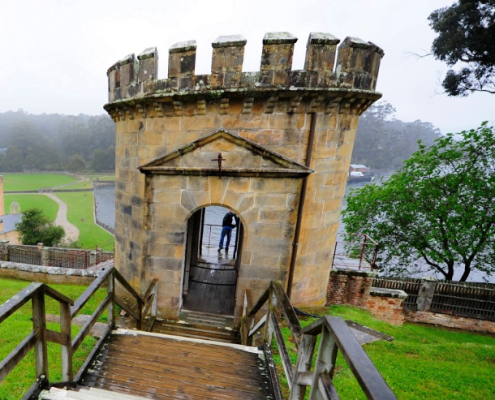 Yet Port Arthur is also a remarkably beautiful, green and lush place, nestled beside tranquil water. Nowhere else in Australia does the phrase ‘her beauty and her terror’ from Dorothea Mackellar’s My Country resonate in quite the way it does here. Our national capital, whose landscape is unlike that of any other Australian city, and the home of our national monuments, Canberra is a very special place. 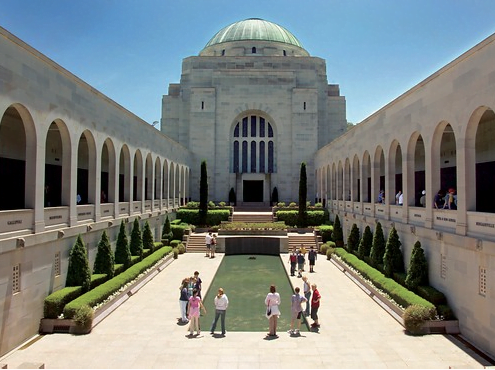 At least once in their lives everyone should visit the National Gallery of Australia, the National Portrait Gallery, the National Library of Australia, the Museum of Australia, the Museum of Australian Democracy at Old Parliament House and the Australian War Memorial. These are not just a bunch of stodgy institutions. Between them, they contain so much of our history and our culture that they are the very heart of our country. * Always have a long and engrossing book in your bag as you never know when – or for how long – you might be delayed. And batteries don’t run out on books. * Pack lightly. You really don’t need many clothes when you travel and dragging heavy bags is a sure fire recipe for a bad back and an even worse temper. I once travelled round the world for three weeks with just a small carry on roller bag. * Travel should be fun so don’t stress out. Get to the airport in time for a coffee or a cocktail. And once you get out of Australia, airports in many cities are wonderful places to spend time in. Schiphol, Amsterdam’s airport, even has treasures from the RijksMuseum on display. * Look like a jetsetter not a bogan. Wear smart but comfortable clothes (no trackie dacks please) and even if you are in cattle class just remember that even a 24 hour flight is a helluva lot better than the months’ long sea voyages our ancestors had to endure to go anywhere. My name is Fatma. 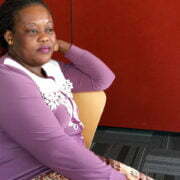 I come from Sudan with my husband. We have eight kids, six boys and two girls. Where did you come from in Sudan? We come from Khartoum and then we are moving to Egypt and then we come here in Australia 2004. We are happy in Australia. Just I’m sad, I didn’t have anyone here, no sister, no brother, no anyone. About your journey, how did you travel? From Sudan to Australia, I live in Egypt four years, and then we do the process to Australia. From Egypt to Australia by plane. And from Sudan to Egypt? From Sudan to Egypt by boat. Can you describe the journey? It was difficult. Me alone with the kids, four boys, it’s very hard for me. And every day I pray, Oh God help me with my kids, until we get to my husband and I’m very happy about it. Was it a dangerous journey? Yes, very dangerous, very scary. Some people stealing some things, some people steal kids. I’m scared, I say, Oh my God, me alone – no-one to help me. Just me with four boys and all just small. Then we are coming very good, nothing happen to us until we get to Egypt. And was it dangerous for you to leave your hometown? Yes, it’s dangerous. It’s very dangerous. The people just kill people and everyone is scared. My Mum died and I didn’t see her and then my Dad died too. What was happening in your hometown when you left? Just rebels, they took people and there were some bad people. Yes. Until now, it’s not safe. Everybody’s scared. 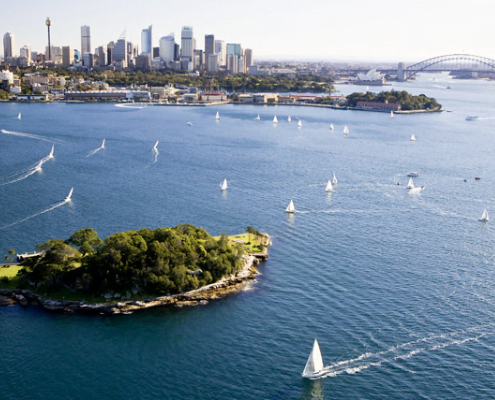 When you first came to Australia, can you describe how you felt? Yes. When I first come, it was very hard. In Sudan, I would just go to school with Arabic. English, it’s a bit harder. And then I know A,B,C….I know some stuff. And when I come here, I don’t know the money. My husband start work straight away, my husband good, he have full English. I call him when we need to go shopping and ask what do we do? He say “ Just take the money and give to some person and then take the money back.” And then when I go to shop, every day I give fifty dollars. I was scared if I give small money, maybe they say, Ay, this lady steal. All my English, I get in the group (Wyndham Women of South Sudan English classes*). I didn’t study school when I come here. Always I have kids, I have kids, I have kids. Ah, I say when can I go to school? When my kids come home hungry nothing can eat, I don’t want to go to school. And then when I get the group like that, I start group until my English now is good. Yeah, I’m very happy. You love coming to school? Yes, yes. This time I have only one daughter, 3 years-old. I don’t want any child now for the moment. When I improve my English, I need to find a job. What sort of job would you like? A lot of people don’t know a lot about Sudanese women. What do you want to tell them about yourself? We are Sudanese. We have full respect. We don’t like trouble. We don’t like someone just shouting like here. Some white people like shouting at people. We are Sudanese, we are scared. And then someone talk with you, you put your eyes down, and then the Australian, he doesn’t like that. When you put your eyes down, he say, “Ah those people, she didn’t have respect.” We have full respect. We don’t know how to eat outside. Everything I do it at home – cooking, cleaning – everything. You do everything at home on time, and then when your husband coming, you respect your husband, give him food, eat the food, and then you take the dishes, do for him some tea. Everything we are doing at home. No-one go out, say I go eat out today. No, we don’t have that. We have full respect. Here some people just forgot the respect. For the kids, not hard. When we’re come here, they all young. Now, all have full English. Sometimes, I want to speak my language, the little one, she didn’t understand and then I push them. I tell them don’t forget your culture, don’t forget your language. Yes, just like that, every day I tell them that. Australia now is good. We are just scared about our kids when grow up – a lot of trouble. It’s very hard for us. Now I understand everything, I know the rules, I’m driving the car. Everything is good. 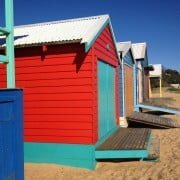 Did you know that women are the reason we have those iconic, brilliantly coloured bathing boxes on the beaches of the Mornington Peninsula in Victoria? At the end of the 19th Century and through the early 20th, the city fathers tried desperately to stave off the shocking prospect of uncovered female flesh. They feared that if women were allowed to undress and change into their neck-to-knee bathing suits on the beaches, public immorality would inevitably follow. The city fathers had already tried to divide some beaches into separate bathing areas for men and women following “indecent bathing during a heat wave”. Their battle for respectability and decorum succeeded to the extent that many boxes were in fact built. 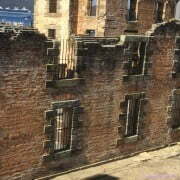 Now only 1300 survive and no new boxes or boatsheds are allowed, with the exception of places such as Brighton Beach. For that reason their value has skyrocketed, in some instances fetching more than A$350,000. Tightly held, the families that own them often pass them down through the generations. Public morality no longer being of concern, they are now mostly used to have a good time at the beach. In summer, you will see owners sitting in the shade of the open box, deckchairs and tables arranged comfortably with food and cold drinks at hand, contemplating the sea only metres from their door. Or you will see them dragging their kayaks from the boxes, a few steps across the sand, and into the sparkling sea for a row along the bay. The owners are spared having to pack their equipment on cars and trailers to return home at the end of the day. But they do have to maintain the boxes in good order and pay fees for the privilege of owning a beach box. We can enjoy them too. They add a riot of colour and cheerfulness to the beach in any season. So take a stroll along any one of the 26 beautiful beaches of the Mornington Peninsula, from Mount Eliza to Portsea, where you can feast your eyes on these iconic structures. 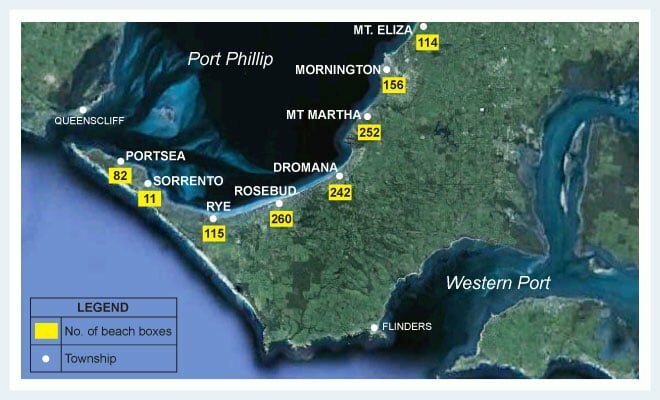 The guide below shows the places you can find these beach boxes and the number at each location. Take a look at the slideshow to see some of these beach boxes. The Mornington Peninsula is approximately an hour from Melbourne’s CBD and is easily accessible via the Peninsula Link freeway. At the end of May 2017, Uluru stood as a silent sentinel over an historic summit of the First Nations of Australia. They had come from across the continent and the Torres Strait Islands, 250 community leaders. At the end of 3 days of deliberation, they issued a powerful and beautifully crafted document, entitled Statement From The Heart. It rejected symbolic recognition. Speaking from the “ torment of powerlessness” it demanded a constitutionally enshrined Indigenous voice in government decision-making. It also called for a Makarrata Commission to supervise agreements with government and lead the way to a treaty. And so another dimension was added to the political, cultural and spiritual significance of Uluru. Uluru is one of the few places in the world to have been awarded dual World Heritage recognition – for both its outstanding natural values and outstanding cultural values. On our trip to the Red Centre of Australia, we found extraordinary beauty, cultural richness, and new perspectives on this iconic Australian landmark. We began with the perspective on Uluru from the distance, at both sunrise and sunset. In the darkness of early morning, we watched as a dark shape outlined by the first rays of the sun began to loom over the flat plain. By day, we saw a monolith, 9.4k in circumference, rising up 348 metres from the semi-arid desert that surrounds it. Both the rock and the sand are stained a deep red by the iron oxide in the earth. 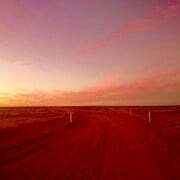 Late afternoon, we watched from afar as the sunset coated Uluru pink, then rich purple colours. 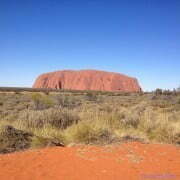 But nothing really prepared us for the shock of seeing Uluru up close. It is not a uniform lump of rock. As you walk into it, you discover oases with vegetation, waterholes, waterfalls, caves with rock art, gullies and rocks sculptured into remarkable shapes. Changes of light, shadow and perspective bring with them continuous shifts in appearance, an impression of movement at odds with the idea of a stolid monolith. In the tranquility of the Kantju Gorge, we were enclosed by towering rocks that spectacularly changed from yellow to gold, orange to ochre, pink to purple, and brown to grey. This breathtaking physical perspective is only a part of Uluru. We began to see that there is another more compelling perspective. We began to learn about the Anangu, the Aboriginal people who are the traditional custodians of Uluru and the country around it, and we pay our respects to them. Their traditional languages are Pitjantjatjara and Yankunitjatjara. Carbon dating on caves, shows that indigenous people have lived in this area for at least 22,000 years, and possibly 30,000. Elsewhere in Australia, there is evidence of Aboriginal habitation dating back to around 60,000 years, making them one of the oldest human societies on earth. Traditional custodianship is quite different from our concept of land ownership. It is not personal possession, but public, common responsibility to care for the land, its flora and fauna, and to carry on that care from generation to generation. For thousands of years, the indigenous people have passed down the knowledge of how to survive on the land and how to survive as a community. But they have not written it down. There are no written texts. There is no sacred literature. They have no Bible, Koran, Sutras, Vedas or Chinese Classics that have guided the survival of other peoples. It is an oral tradition that has sustained the Aboriginal people with a strong culture in Australia for 60,000 years, in some of the harshest terrain on earth. The landscape is their sacred text. The land is endowed with sanctity. Aboriginal spiritual heritage, history, laws, culture, knowledge, geography are all embodied in the land. They read their land – its shape, its contours, its plants, animals and birds. And they express this connection to the land through songs, stories, ceremonies and art. The foundation of the culture is called Tjukurpa – Creation – when the ancestors, changing shapes between humans, animals, birds and spirits, roamed the formless land. Their travels, battles and experiences gave shape to the land and created its distinctive topography and all life. As well as creation stories, Tjukurpa is a body of knowledge governing human behaviour and care of country. According to Tjukurpa, Uluru was formed by Two Boys. They were playing at the Kantju waterhole, piling up mud until it was the size of Uluru. The long channels and gullies on the southern side of Uluru were formed when the Two Boys slid down from the top on their bellies, dragging their fingers through the mud. The python woman, Kuniya and the poisonous snake man, Liru, are other ancestors who shaped Uluru and left visible marks. Signs in the rock chronicle their struggle and the places where the grieving Kuniya struck Liru dead in vengeance for spearing her nephew. When visiting Uluru, you are not just walking amongst boulders and rocks. You are following the path of the creation stories that the Anangu continue to celebrate. The spirits of the ancestors are believed to still dwell here so it is considered sacred, and parts of Uluru are closed to the public. The initiation of the young into the complexities of Tjukurpa continues. And in caves in Uluru, grandfathers pass down knowledge to young boys, drawing on the cave walls as a teacher in any other classroom would illustrate on a blackboard. In separate caves, women elders pass on women’s business to young girls. It is an ancient culture that is still alive and still defines the indigenous people. Another new perspective we had on Uluru was looking up to the desert sky – the stark blue of the sky by day and the sheer brilliance of the night sky. Since tourist and local accommodation is concentrated in a particular area, the township of Yulara, electric lighting does not blot out the stars as it does in cities. You can look up and clearly see endless swathes of stars shining directly above you. Uluru is within the Uluru – Kata Tjuta National Park which covers 327,414 acres of Australia’s desert outback. In 1985 title deeds to the land were handed back to the Anangu, and it is managed jointly by the traditional owners and Parks Australia. The Cultural Centre in the National Park is very beautiful. Built from mud bricks, it represents the two ancestral snakes, Kuniya and Liru. Inside, there are outstanding exhibits about Anangu culture, and you can purchase original indigenous artworks. The bookshop also provides information on a variety of walks around Uluru. 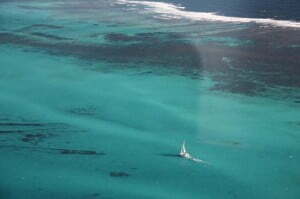 Different tour companies also offer tours. Since Uluru is a sacred site, climbing the rock is disrespectful. It is also dangerous, so visitors are requested not to do so. The best times to go are during the Australian winter and spring, when the nights may be freezing, but the days are mild. In summer, temperatures can be extremely hot with outdoor activity limited to the morning hours. The hotels all belong to one group so there is not much competition, but there is a range of accommodation from camping to 5-star tents and hotels. Our photos were taken only where permissible. To see each photo separately go to our Gallery page. The drover, stockman or ‘ringer’ and he is called, is an iconic figure in Australia. He has been immortalized in poetry, songs, folklore, paintings and literature. But there are few real drovers and stockmen left. 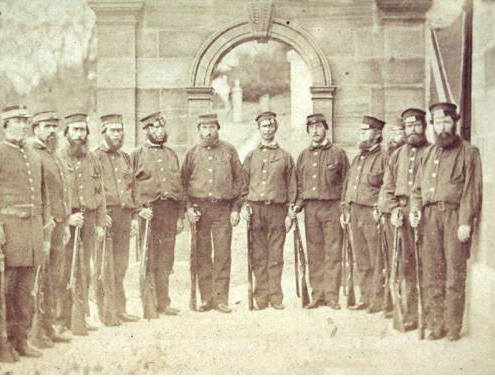 Nowadays, these men of the outback have been replaced with road trains and helicopters. I met Luke on the airstrip the day he arrived at Fitzroy Crossing in the Western Australian Kimberley in 1967. I was working as an itinerant nurse for the Australian Inland Mission and was there to put an esky of medical specimens on the mail plane when this tall handsome man dressed entirely in black came down the steps nonchalantly carrying his saddle over his shoulder, much as a city guy would carry his sports coat. I was a bit blown away I can tell you – he was a very romantic figure and I have fond memories of having many suppers in his stock camp beside the campfire under a million stars and listening to the music of horse bells. Luke McCall was born into a stock riding family at Nebo over the range from Mackay in Queensland in 1932. Aged 15 he threw his swag and saddle on the mail train and headed out west where he picked up a job as a ‘ringer’ (stockman) on Lorraine Station way up north in the Gulf on the Leichardt River. For over half a century, Luke would live the life of a drover and stockman in the Australian outback. Droving meant spending each and every day in the saddle – often for nine months in a row. The work began at dawn and frequently there were night watches as well. No days off or spells. The working life of a stockman was seasonal. It started at the beginning of the Dry season in early April when the horses were mustered and broken in, more than a hundred on most stations. The head stockman would then allocate freshly employed stockmen their ‘plant’ – usually 10-12 mustering horses, some camp-draft horses and a night horse or two. When all was ready, the stockcamp consisting of about 8-12 ringers, a cook, a horse tailer and the head stockman would ride out, accompanied by their pack horses and horse plant. This departing cavalcade was always an exciting sight. They worked to a schedule in that they had to have x number of bullocks ready at such and such a spot on such and such a date ready for transport to the meatworks. These mustering rounds lasted about 3 months. Stock was mustered one day and ‘processed’ the next. Calves were roped and pulled up to the bronco panels and branded, ear marked, castrated, mothered up and let loose. Bullocks were drafted into a separate mob and held, fed and watered until such time as they were picked up by the overland drovers or, since the 1960s, road trains. At the end of each mustering round the stockcamp would go back to the station for a brief break which usually coincided with the local rodeo or race meeting. By the end of the third round in late October it was far too hot to work cattle so the ringers rolled their swags and went south for the Wet season. This was Luke’s way of life on several Gulf country stations; Kamileroi, Norfolk, Coolullah and Gleeson to name a few. Like most ringers he would take an occasional year off from the stockcamp to go overland droving. He made a number of droving trips from Camooweal to the Kimberley and back with the legendary packhorse drover Bruce Simpson with 1,500 head in hand. These droving trips would cross 2000 kilometres of the harshest, hottest, most arid and most beautiful parts of Australia, from Western Australia to Queensland. The droving life was almost sedentary compared to the thrills and spills of mustering wild cattle. It too started at first light when the mob slowly moved out along the stock route feeding all the way to ‘dinner camp’ where they were given a spell then a long drink of water and then moved out in late afternoon to settle down on good feed when it could be found. The ringers, who had been in the saddle since dawn, took shifts in riding around the mob on night camp singing as they rode to settle the cattle. There was always a risk that the mob could rush at night. In this case the night watch would be joined by the rest of the men who woken from their sleep, would grab their night horses which were always saddled and tethered nearby and ride to turn the lead back on itself to slow the mob down. In the early 1970s, Luke was employed to set up a cattle station, Palumpa, 250 kilometres south-west of Darwin which was eventually to be run by the local aboriginal group. Starting from scratch this involved years of rough living camped on a waterhole until the homestead complex was eventually established. It involved catching and transporting wild bulls to the meat works for an initial cash flow and stocking the station with quieter cattle as well as horses. Luke made several trips to the Cloncurry horse sale where he would buy up to 100 horses at a time, dip them and truck them to Daly River, then drive them 120 kilometres to Palumpa single-handed. The ABC devoted a Big Country programme to the ‘Curry Sale’ which featured Luke. This publicity was nothing compared to that which he received in 1977 when he rescued the man who was the real “Crocodile Dundee”. Rod Ansell had been stranded for eight weeks on the banks of the remote Fitzmaurice River after his fishing boat sank. Ansell salvaged his two eight week-old bull terrier pups, a rifle, a knife and his swag and set up camp in the fork of a tree out of reach of giant saltwater crocodiles which threatened him and his pups. He shot those that attacked him. Rod Ansell never counted on being rescued but Luke and his stockcamp made a once-in-a-lifetime visit to that area and found him. 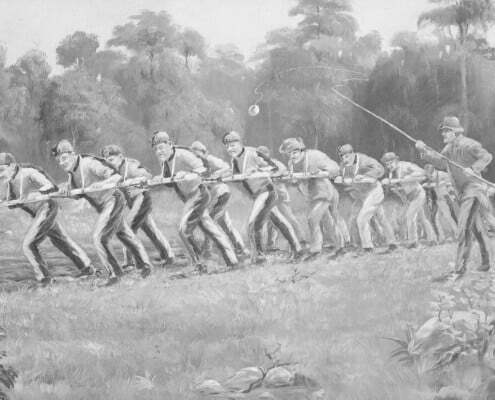 When the story hit the press, Ansell was hailed a modern day Robinson Crusoe. A book and a film To Fight the Wild followed. 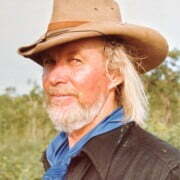 A subsequent Parkinson interview sparked the interest of Paul Hogan and led to the creation of Mick “Crocodile’ Dundee. After his Palumpa years, Luke spent time working on Helen Springs and Wave Hill stations in the NT by which time stock work as he knew it was long gone and he was probably the last of the old time stockmen still standing. Jackeroos on quad bikes and helicopter mustering became the norm. He retired in 1993 following a hip replacement and made a home for himself in Batlow in NSW. He turned his hand to writing a monograph, Before helicopters and road trains: What was expected of a stockman. It was printed by The Stockmen’s Hall of Fame in Longreach where it is still in print and remains a best seller. He has also written Stories from the Stockcamp which takes the point of view of stock that he has spent his life working with. In these stories, we meet a clean skin bull; Crooner the night horse; an outlaw bullock; Ruadah a liver-coloured mule; Winnie a coaxer cow; Dove a breaking-in mare and Tarpot a bronco horse. As yet unpublished, these stories reveal his great feeling for and understanding of stock. Each year Luke would look forward to the annual trip up north to the Drover’s Camp in Camooweal. He met up with old mates along the way from Wagga Wagga to Cloncurry where he was greeted with great affection by men he worked with and I dare say with great reverence by many whom he mentored when they were young. His name stands high right across the north – he is indeed a legendary stockman. they don’t know who he is. than the legend Luke McCall. a red bandana ‘round his neck. he’s up there with the best. and leave that stuff to someone else. not on what he had to say. though now unsteady on his feet. he’s a class act all his own. to pass some yarns around. gives him reason now to smile. that we’ll never see again. is the legend Luke McCall. Read Patricia’s post in Woman In…Outback Australia: Camooweal, Queensland about the annual Drover’s Camp Festival that she and Luke would drive 7,000 kilometres to attend each year on the border between Queensland and the Northern Territory. This camp takes place in August and is open for all to attend. Patricia McPherson is a retired nurse from Victoria. She worked as a nurse for years with the Australian Inland Mission at Fitzroy Crossing in the Western Australian Kimberley region in the 1960s and regularly travels to the outback which she considers her ‘heart country’. My daughter Genevieve and I drove 4000 kilometres from Port Augusta in South Australia, to Darwin in the Northern Territory, in two weeks. The direct route is just over 2,700 kilometres. But we wanted to see the outback. Genevieve shares my love of the Australian outback, the remote deserts, the unique heat, the waterways and the people. 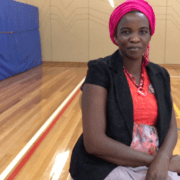 After completing a year of work in the Pilbara region of Western Australia she was to begin a new position in Darwin. This meant she needed to bring her car from Western Australia to Darwin. She had a month before beginning her new position, so I volunteered to accompany her on the drive between Port Augusta and Darwin. With two weeks to cover the distance, we decided to meander our way north detouring to our hearts’ content. We drove for 3-4 hours each day with lunch and morning tea stops. In February the temperature sits on 40º all day, and only after sunset, begins a slow, nonchalant descent to 27º, reached around three or four in the morning. After dawn the sun marches back into the day with gusto and the temperature peaks by 9am remaining there for the rest of the day. Due to the heat, our pattern was to drive during the middle of the day taking advantage of the car’s air-conditioning, and arrive at camp in the late afternoon or early evening, allowing time to set up the tent and cook. We planned activities such as walking for the early morning, and were back on the road mid to late morning. Until now the Oodnadatta Track existed, for me, only through tales my father told me and stories in the books of my adolescence. It was a place remote and fearful, a desert highway for camels, telegraph linesmen and the legendary white Australians of cattle stations and homesteads; a place where the heat and dryness could kill. Our journey along the Track started at William Creek. It wasn’t our intention to drive along the Oodnadatta, at least not as far as we did. It was only as my daughter and I drove further into remote South Australia that we grew more confident, and that the Track began to lose the unpredictable power my imagination had given it. We arrived at William Creek hot and dusty from Coober Pedy, passing only one other car in the three-hour drive. The desert we had driven through was either gibber plain or red sand, usually with low vegetation. At William Creek there is a hotel with accommodation, an airstrip that crosses the track and a campground. No need to book in February but I would recommend booking in the more popular mid-year months. The town, once a stopover for the Ghan, now claims fame as having Australia’s most remote pub, and as a base for exploring Lake Eyre by plane, which we did. The pub is a museum in itself. Made of timber with timber furniture, it holds a dusty collection of old photos, superseded farm tools and items from around the area. And it serves great dinners. We enjoyed a Thai curry and a ‘parma’, so large it curled over the edges of the plate. A sturdy wood heater in the centre of the room suggested night temperatures must, at some time, get very low. 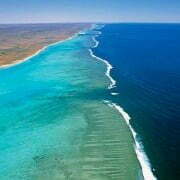 Lake Eyre has water in it once every ten years, and I had read that this was one of those years. Rains up north in January meant there was water in February. And indeed, we are lucky. Before leaving Melbourne I booked a one-hour sunrise flight through Wrights Air. There are a number of flight itineraries available and a number of companies running them from various points of departure, so check which flight suits you best. The outback is beautiful from the air. As the squirming ball of sun climbs to the edge of the world before melting across the land, the rocky ridges and daubs of vegetation below change colour. The sky and the ground are every shade of pink, purple and red. Nothing can prepare you for the sight of Lake Eyre from above: not the tricky little lake we flew over earlier, nor the images in geography books. It is a huge expanse of water, as far as you can see. It is an eerie, rippled, wind-streaked blue as still as if painted onto the salt. We followed sweeping, salt-lined arcs in search of birds. At Oodnadatta town we decided on a detour through the Painted Desert. 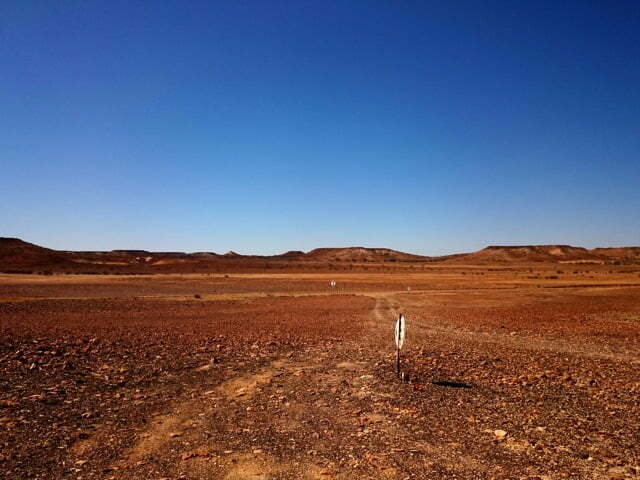 We had needed to calculate whether this the detour, still considered a section of the Oodnadatta Track, was a safe option given the distance, the time, our diesel and water supplies. This section of the Track would have to be one of Australia’s most remote, dusty roads and this suited us. More like the driveway to a homestead than a road, it was in good condition but required attention to skirt a few deep wheel ruts and pot-holes. The Track wound around small hills and ridges and at about half way, passed through the Painted Desert. From the top of a viewing hill we looked over some of the most beautiful country I have ever seen: dry, sculptural and full of colour, yet still and silent. It was a huge watercolour landscape. At various junctions along the road a sign and a faded track indicated a station or homestead out there somewhere. It is easy to lose your sense of direction in the desert especially when tracks and signs have deteriorated and look the same. This happened to us when, thinking we might camp the night, we turned off towards a homestead. When attempting to join the main road again we were confused by the choice of three roads. We drove for an hour or so not knowing if we were heading in the right direction, and while this caused some anxiety, it was a part of the experience. The Mereenie Loop is an unsealed four-wheel drive road between Uluru and Alice Springs. The section of the loop between Kings Canyon and Alice Springs is referred to as Namatjira Drive. It follows the West MacDonnell Ranges. The West MacDonnell Ranges are striking in the brooding light of the wet season. The skies sink towards earth with the weight of rain. Thunder tumbles around the rim of the ranges and sheet and fork lightening flash. But the sky holds onto most of the rain and the labouring storm takes a rest for a few hours, when the theatre begins again. Driving this loop is an experience I will not forget. There are a number of places to stop along the way to do a short walk, or to detour to a lookout. Do this, particularly after rain as the bush smells like I imagine heaven to smell. Bird life is also abundant after rain. In small, fluid and shifting shapes, flocks of coloured finches move from tree to tree. Willy Wagtails hop along disused stockyard and fencing posts, and according to aboriginal stories, alert the walker to the presence of another. We stopped at Gosse Bluff, (Tnorala conservation reserve), Redbank Gorge, Ormiston Gorge, the Ochre Pits, Serpentine Gorge and Ellery Creek Bighole, all easy walks. We bush camped and there are plenty of spots to do this. If you are after something more comfortable there is a welcoming and rustic hotel with rooms at Glen Helen Homestead Lodge. In February, the mosquitoes are very active after dusk and before sunrise. After sunrise the flies take over! We carried plenty of mosquito repellent and set up camp early enough to have finished dinner before sunset. For the flies we had hats with fly nets. Nyinkka Nyunyu is a very impressive art gallery, museum and cafe run fully by the aboriginal people from Tennant Creek. What we expected to be an hour’s stop became a three-hour exploration. The centre and tour we had were all engrossing and we had no sense of time passing. Because we were the only visitors it being out of season, the curator gave us a personalised, ‘story’ style tour. The curator was an aboriginal man who had experienced some of the history and happenings that were depicted in the exhibitions and storyboards. All aspects of aboriginal life and culture, as well as contact and relationships with the Europeans, were covered in the displays. The gallery walls were decorated with the work of many local artists, whom we met working in the studios incorporated into the building. There was so much art available for purchase that it was difficult to decide which to buy, and being a gardener with interest in bush foods and plants, I finally decided on a canvas called Bush tomatoes. In the absence of a personalised tour, visitors carry a player with numbered recordings that match numbered stations around the centre. We followed this in the garden, which has been planted with educational purposes in mind. It is well laid out and garden enthusiasts will love it. There is a kitchen garden with bush tucker to supply the café kitchen. The café was due to open a couple of weeks after our visit, however we got to meet the trainer from Charles Darwin University who had just arrived to train some young people to work in the kitchen. Next visit I will stop for lunch! The ideal time to travel to the outback is in February. While it is very warm and possibly very wet in February, the roads and camping grounds are empty. Be aware however that if you do choose to travel at this time you will need to check in regularly with a government road report site such as the Northern Territory road report website (www.ntlis.nt.gov.au/roadreport), or a tourist information centre. We also asked the locals for their opinions on roads. Roads can become impassable in the wet season, or may be damaged after heavy rain. For travelling off the major highways a four-wheel drive vehicle is essential. Jacinta Agostinelli lives in Melbourne. 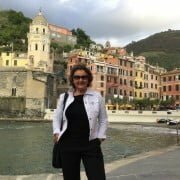 She spends her time writing, caring for her grandchildren, developing and maintaining gardens using sustainable and organic methods, and is a director on the management committee of SPAN House in Thornbury, Melbourne. She enjoys spending time with her family and travelling near and far. A convict ploughing team breaking up new ground at a farm in Port Arthur. Created circa 1838 by an unknown artist. Reprinted as a postcard circa 1926.